Is finding a babysitter online too risky? Many families, like us, do not have relatives living nearby to call upon. That, or grandparents are still in work themselves or have an active social calendar. The old standby family friends may be few. Finding appropriate childcare used to start by scouring noticeboards in play centres, with asking your neighbour’s teenager or by word of mouth. Now most parents rely on online resources and apps. You order a cab, choose a restaurant, book a holiday, even find a partner but is it too risky to seek childcare online? When my son was little, I used the internet to find both a regular childminder and emergency babysitter. Not a stab in the dark with a site such as Gumtree, where you are let down buying a bike. Numerous specialised websites have emerged where parents can find caregivers and babysitters with a few clicks of a mouse. No more un-responded to calls and ignored voicemails. The process was stress free and simple. Are some things too important to entrust to strangers or do over the internet? You would not hire someone, even if Sally next door said they were marvellous, without doing research first. Want to be able to relax and not worry when leaving your child? Trusted websites allow parents to view qualifications, backgrounds, availability, comments from other users etc. Instead of being fearful, be empowered, make a positive informed choice. Granted online feedback does not always ensure competence but it is up to parents to speak to potential carers on the phone and arrange at least one face to face meeting before you use their services. Look at social media accounts. Its ok to be selective, consider a trial run. Trust takes time! No matter what method you choose, finding the right person comes down to who is right for you and your family and this is where Childcare.co.uk comes in. 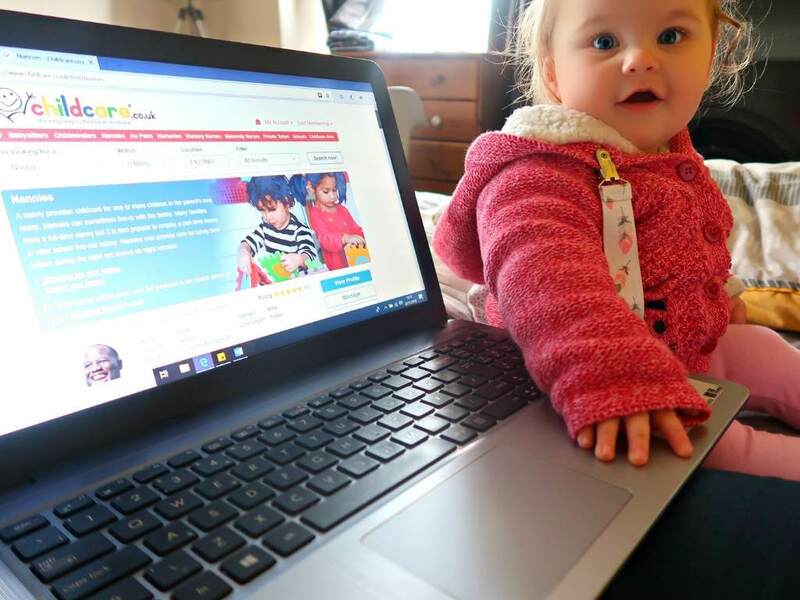 Childcare.co.uk is the Uk’s largest, multi-award-winning online networking platform that connects parents to providers. 1.8 million users can’t be wrong! There is a quick (and easy to use) search for local qualified caregivers; nannies, childminders, nurseries, midwives etc where you put in your postcode. There is plenty of choice, within 10 miles of my home there are 192 babysitters! You can narrow these results down with distance from your home and there is the opportunity to search additional specifics such as those with a full driving licence or special needs experience. An advanced search even offers the availability to view if they’re smokers or non-smokers! A positive feature is that as well as the search bar there are tabs for direct pages for key professional’s which has informative links i.e. what they are, how much to pay etc. We created a free profile, easily through our Facebook account. I like the fact the site has an unpretentious layout and whilst key details are required you do not need to spend 45 minutes filling out forms. Add your name, location, childcare requirements and contact number, we skipped the profile picture and about you sections. Your profile is shown to local childcare providers who are also immediately alerted of your requirements by email. You can read and reply to messages for free and we had four contacts by the end of the next day. The websites effectiveness is in how simple it is to use. What to look for when choosing a provider. Search results will bring up local professionals and with one click you can view their full profile. Summaries show significant facts such as if they are OFSTED registered. Look for providers that have taken the time to complete their about me and experience descriptors. When looking for childminders I looked for their outdoor play facilities and simple things such as food hygiene certificates. Schools drop off and availability are listed as are fees. Compare different providers, you are usually looking at £5 an hour variable for childminding. You can view documents and the site alerts the user to if a provider has said they have a certification but not evidenced it. This offers me a lot of reassurance. You should ask them about their work experience and past clients. Ask for phone number of a couple of parents you can call to verify the persons suitability. The site reviews have commentary and ratings for setting, cleanliness, food and communication. You probably want someone with basic First Aid and DBS check. Check they have adequate child/adult ratio. You should be able to find a quality sitter in your price range. Expensive doesn’t always mean best. Check extra hour and food charges. Think about how often you’ll need them and how many hours you’ll need them. Are they flexible? It’s always good to ask if they are available for emergency cover. Ask them for their thoughts as they are the ones most affected by this decision, make them part of the process. Plan a meet and greet with your children and observe how everyone interacts. Childcare.co.uk advertises. Members arrange directly with each other. Whilst the website provides lots of information, advice and tools that allows parents to undertake their own checks this is their responsibility. If you are feeing apprehensive their Safety Centre offers advice. Have you used the internet to find a sitter or childminder? Would you trust the internet to find someone?